Flat roofs are a great choice; they provide solid protection, easy cleaning, and dual purpose functionality. This remains true as long as your roof is undamaged. Neglect and environmental hazards can cause roof damage that affects other areas of your home or business. For fast, effective, and high-quality flat roof repair, Lake Oswego resident call Pioneer Roofers. Your flat roof repair experts! Not all roofing companies are created equally. Some offer multiple services. These jacks-of-all-trades may drywall, paint, and more, but specialize at none. You don’t want to risk your flat roof repairs to a company without the necessary experience. With more than 20 years providing flat roof repair Lake Oswego residents depend on, we employ the veteran professional roofers you’re looking for. Fast Damage Remediation – When you call us for roof repair, we provide damage remediation first. This is especially important in an emergency situation. Water damage is progressive. It multiplies instead of moving at a constant pace. We quickly identify damaged areas and take immediate action to stop and limit ongoing damage. This can save you from costly restoration. Accurate Diagnosis – Our roofers and technicians know exactly what to look for. Once ongoing damage is contained, we’ll identify the severity of the problem. Before moving forward with repairs we’ll consult with you. Our technicians are always up-front about pricing, repair time, and the extent of the damage. We know this can be stressful, and are happy to answer any questions at any time. Expert Roof Repair – When our experts perform roof repair it doesn’t just bandage the problem. We’ll restore your roof to its original strength and protection. This is done using the highest quality materials and construction techniques. We can work on any flat roof type on both home and commercial properties. Don’t trust your roof to a company that “…does roofing too.” Choose a local flat roof repair company that only does roofing. Roofing is all we do, and we do it better than anyone. When it comes to flat roof repair, Lake Oswego needs a company that can handle it all. No matter what your problem is, we can repair it. This includes major and minor flat roof repair. Some problems are more common than others. 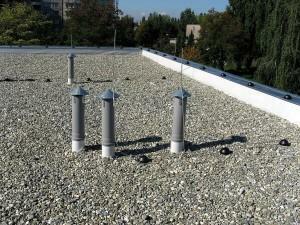 These are some of the more frequent problems we repair on Lake Oswego flat roofs. Contact Us for Flat Roof Repair Today! No matter what you’re facing, we’re here for you. For standard repairs and emergency situations, Lake Oswego trusts our professionals for dependable flat roof repair. Call (503) 281-0305 or Contact Us for flat roof repair in Lake Oswego today.